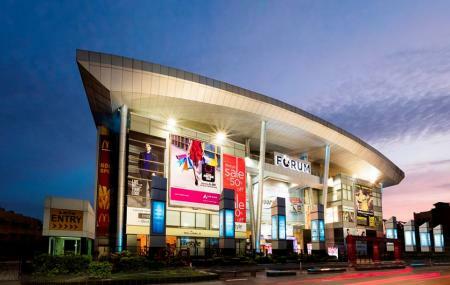 One of the best malls of Chennai, the Forum Mall dates back to those day when malls were comparatively a newer concept. Sprawling over 6 levels, this is also one of the biggest malls in Chennai. Entertainment opportunities are endless here with the plethora of activities ranging from shopping, dining, movies, gaming and more. You can literally spend the whole day here, without noticing how the time flies. Being home to some of the best brands in Chennai, the mall is flocked by shopaholics. All this and much more, make this place a popular hang-out jaunt of locals. A convenient location renders to the fact that the mall can be easily accessed from anywhere. How popular is The Forum Vijaya Mall? People normally club together Arupadai Veedu Murugan Temple and Armenian Church while planning their visit to The Forum Vijaya Mall. Mall management is good. Would appreciate if there is an check on the service charges levied by the ones hosting joy rides on the ground floor. Its almost daytime robbery. The ones been there can easily relate to what I meant. One of the best Shopping Malls in Chennai. The best part is the ambience of cinema. Vital thing about the mall is one may find products of varied prices. So it's not the shopping place for rich people only, but for mediocre as well. Overall an attractive place. The mall is good. Prime location. Nice movie theatre. But, the parking. RS 30/ hr. And there is no upper limit. I came for a movie and ended up paying for the the ticket cost as parking fee. Seriously? Very vibrant mall with addition of movie screens with artistic ambience that are one of the finest in the city. Food and snacks in the theaters are pretty good quality. Mall has some very good outlets for both men and women clothing, hyper market to satisfy most home needs. Games and food court in the last floor supported with good parking facilities. Personally, my favorite in the city for it supports purchasing in any range that attracts everyone alike. Nice Very important for me and you. I m very happy. Very good place. All train are made here and all body train are made here .so I request to you please come one time here. I am very happy .why I go here so very important place in our life because I travel in train so know about train which material use so I am happy.